Imagine waking up in the morning and you scream "it's Monday! I am so excited to get back to work!". Imagine slapping the alarm off and then break into a musical inspired montage where you tap dance to the bathroom and breeze out the door, excited for what the day holds for you. Who gets excited about Mondays? Well, it depends on who you ask. Someone who only works on the weekends would be super excited because Monday is the new Friday for such a person. 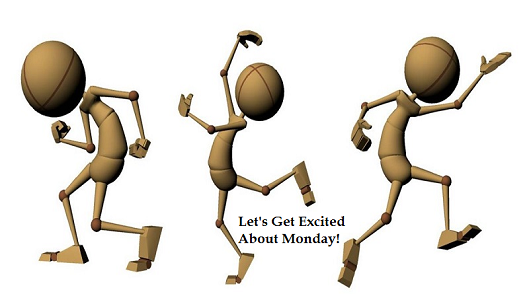 However, if you work the regular Monday – Friday, you might have to "find" some excitement about Mondays. In prep for a new week, here is an inspirational quote. Some people are unemployed. Others want to work but are not physically or mentally capable. So, it is good to have a job that makes you look forward to waking up in the morning. . . or at noon if that's your case. Besides, you should be thankful you've got something bringing in money. Everyone has a goal, vision, or dream. It's something my sisters and I prefer to call purpose. Your job gives you an opportunity to fulfil a purpose. Wherever you find yourself – especially if you do not like your work/job – remember, it is temporary. Do all you can to make a difference in that area. And if you do like your job, there is an opportunity to improve and be better at what you do. Yes, money. Like I stated earlier, job means mula, dough, currency. . .Money answers all things, right? So work may be unpleasant, but you just have to work, work, work, work. Even the Bible supports "no food for a lazy man". Use your work as an opportunity to be a better person — improve your character, business, and confidence. . .and of course, bring in that money! Yes, sweeties. Let's get excited indeed! It’s going to be a long week, but as you can see, there are plenty of reasons for me to be excited about Monday! Rather than focusing on all the stressors at work, make a list of what you're excited about your job. This will help you refocus your mood and put more weight on all the exciting things your job offers you. Cheers to living life filled with positivity, inspiration and love. . .
Until next time. . . Have a phenomenal week and keep making a difference one day at a time. Stay inspired! What keeps you being motivated on a Monday morning? Share your excitement!